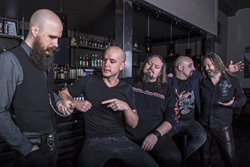 Somewhat off the radar for several years, Sweden's Cloudscape has stayed active writing music for their new and fifth album, Voice Of Reason. It's somewhat of a return to the form with their melodic heavy/power metal with some prog nuances. From the start, some of the first things I noticed were the speed and heaviness of the songs. Mostly I found this in the strength of the riffage, both brisk and enveloping the songs. The rhythm section echoes this strength, becoming the engine that puts the acceleration into their power metal. You definitely hear these things within Futuristic Psycho and Thunders Of Extreme. However, what makes their power better is the latent, nearly subtle, rock groove that makes songs sound like heavy metal rock and quite catchy. This found in Don't Close Your Eyes and All For Metal, in my opinion the two best cuts here. Not so much for the title track. It has this lush ethereal, sometimes symphonic, start and ongoing layer. Yet it also has this chunky riffs and plodding pace early on. But there's a pretty awesome guitar solo in the later third saves the day. More interesting, and a song with greater depth and dimension is the closer, In Silence We Scream. It uses reserved acoustic guitar and vocal start to build to a fierce heavy metal in the center and finish with several blazing solos. All in all, Cloudscape's Voice Of Reason keeps the band steady and on point to create interesting and entertaining power metal. It's definitely worth checking out. 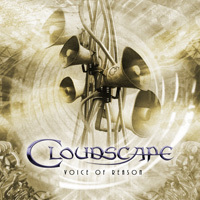 Cloudscape's Voice Of Reason keeps the band steady and on point to create interesting and entertaining power metal. It's definitely worth checking out.